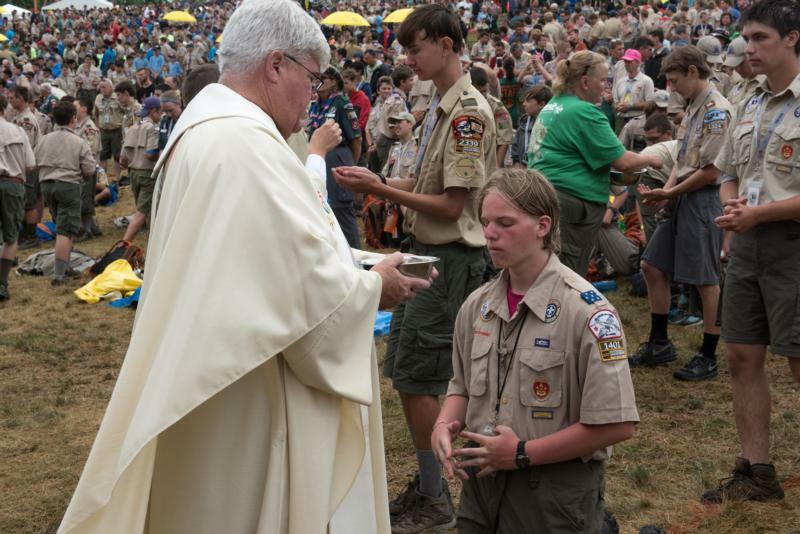 Alex Gray has grown up with two strong connections in his life: being Catholic and being a Boy Scout. So when it came time for the Wilmington, Delaware, teen to pursue the Eagle Scout rank, it made sense for him to take on a project that combined the two. Gray created an outdoor prayer circle on the side of St. Elizabeth Catholic Church in Wilmington to give more prominence to a pair of statues of St. Bernadette and Mary, the mother of Jesus, that had previously been hidden by the church convent. Working with local construction companies, he arranged for the two statues to be moved closer to the church. Taking what was previously an empty grassy plot, Gray cleared the area and added a concrete walkway. He solicited donations for four stone benches etched with inscriptions facing the statues. Plantings completed the area, resulting in a cozy outdoor space inviting prayerful reflection. Only about 5 percent of all Boy Scouts actually reach the rank of Eagle Scout. Gray’s own challenges in coordinating with construction companies, dealing with weather delays and other unexpected problems make it easy to understand why. It took nearly seven months for the project to be completed, longer than Gray said he anticipated. There were delays with getting the benches and moving the statues. But in each case Gray was able to reach a solution, and the lessons learned along the way made the experience a valuable one, he said. Gray hoped to complete the project before his 18th birthday, a goal he achieved despite the logistical hurdles. “The leadership skills I gained from this were tremendous. Being able to take charge of this process and make sure everything went to plan took a lot out of it me, but it was worth it,” Gray said. Gray credits Boy Scout Troop 285 with giving him confidence, skills and lifelong friendships. In an age where many young people are drifting away from organized sports and skill development programs, Gray — who became a Cub Scout in first grade — said he is grateful for the opportunities scouting has afforded him. The response from St. Elizabeth’s has been overwhelmingly positive, Gray said. Now that the weather is nicer and the flowers are coming in, there are plans for a blessing ceremony to celebrate the new space. This fall, Gray will leave Wilmington and head to West Virginia University to study sports and adventure media. It’s nice to know he’s leaving a piece of himself behind.